Hello everyone. 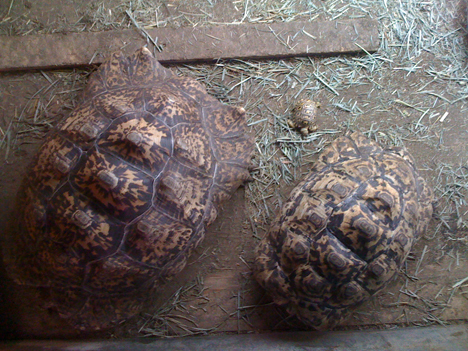 Many of you provided great feedback last summer and fall when my Pardalis Leopard laid her first clutch in August, then again in Sept, then in Oct, then in Nov. Thanks for all your help. No new clutches since, but on Saturday this past weekend I found my first hatched baby FROM THE OCTOBER clutch - no hatches from the August or Sept yet. From candling it looks like there are viable eggs in all 4 clutches, maybe 8-9 total viable out of 30 total eggs. Our new baby is in great health and freaking adorable! My questions are - is this normal that eggs hatch from clutches out if order? Also, should I expect eggs from the same clutch to hatch soon or could they still incubate for months? From everything I was reading Pardalis Leopards take from 8 to 15 months to hatch - this one hatched in 5 months. Does this mean that the eggs from the same clutch could take another 3 to 10 months? It all new to me.